Viverae wellness primes its own pump for an EEOC wellness lawsuit « They Said What? General: What customers have actually signed up for this and are willing to admit it? Provision #2: Since your biometrics are out of compliance with USPSTF guidelines, wouldn’t a customer be risking an EEOC lawsuit by “requiring” every employee to do this against their will, subject to a large fine? Provision #4: Isn’t this the same as saying “If you sign up for two years, we’ll give you a third year maybe at a 20% discount if you do everything perfectly, but by doing so you waive your right to cancel after one or two years” ? 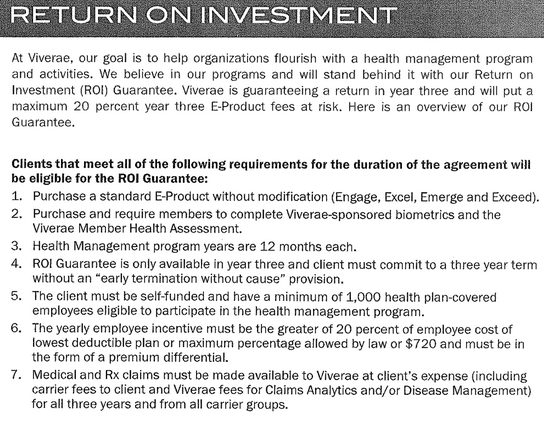 Provision #5: Has any customer of Viverae or any other wellness vendor with 1000 or more employees completed HRAs and submitted to biometric screens at a 100% rate, as you require in Provision #2? Provision #6: How could a health plan get a positive return on this program by offering people $720 apiece, when wellness-sensitive medical events account for less than $200/person in claims spend? 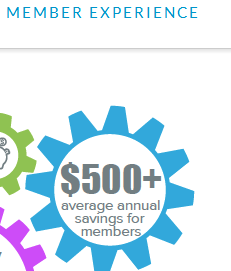 Speaking of Provision #6, if your very own website says savings are $500/person (I’d be curious what legitimate academic research supports that), how can you guarantee savings when the cost of the incentive alone is $720? By Al Lewis in Uncategorized, Wellness on August 27, 2014 . You can sue me, but I won’t be settling.